← Are You Ready For 2015-06-30 23:59:60? Today, WordPress announced a critical security update that should be applied to all installations of WordPress. Whilst you are hopefully applying updates to the main WordPress installation automatically, now would be a good time to log in to the control panel and check for updates. In addition to the main WordPress installation, it is worth checking for other updates – plugins and themes – which do not automatically update. And many wordpress break-ins of recent times have been due to vulnerable plugins. It isn’t as if checking for updates and applying them is too time consuming – doing that for all three of the blog sites I run took less time than it took to write this posting. On a practical note, WordPress suggests performing a backup before performing an update, but providing that you perform regular backups you can probably take the risk of not bothering. I have been updating WordPress installations for years and except for the very earliest days, have yet to have an issue. Click the “Plugins” menu option down the side. Click the “Add New” menu option that appears. Click on the “Install Now” button next to “WP-DB-Backup” (it’s underlined manually above). Ignore the complicated bit to the right where you select additional database tables to back up. For now these can be ignored. 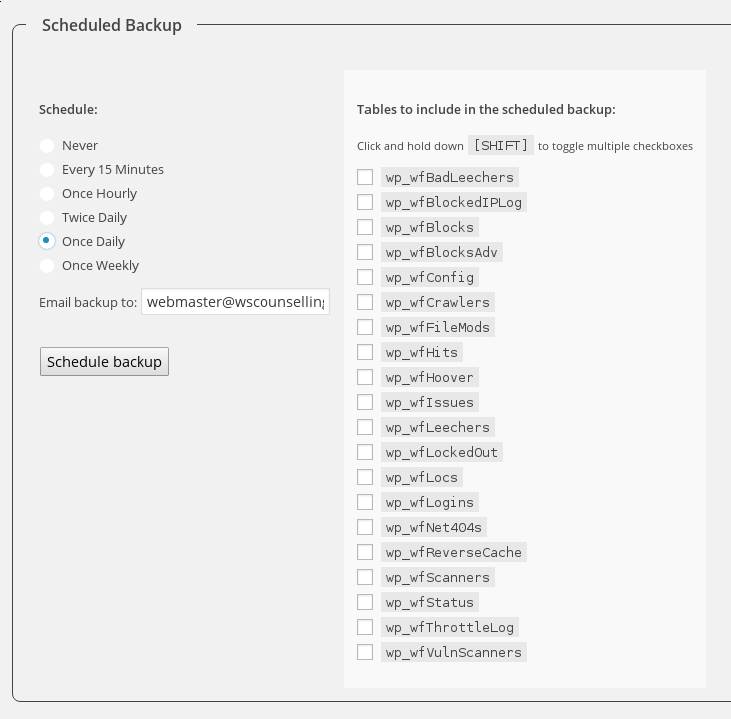 Simply select a frequency of backups (once a day is reasonable) and specify an email address to send to. Then click on “Schedule backup”. There are of course other options for performing backups; many of which have many more features but they do tend to ask you to pay for them. And this one is the one I have been using for long enough that I can advise to use it. This entry was posted in General and tagged WordPress. Bookmark the permalink.